Last Friday, my wife and I saw "World War Z". We actually saw a movie on opening night! I can't think of the last time that happened. The film is an adaptation of Max Brooks' book by the same title. I'm most of the way through the book, and if you haven't read it yet, you should pick up a copy. It's not a novel in the traditional sense; it reads more like an anthology. But it's a suspenseful book with interesting characters, culture and settings. I knew beforehand that the movie would not follow the book's flow. Otherwise, it would simply be a series of flashbacks from the view of many characters. Instead, the film focuses around Gerry Lane, who had recently worked for the U.N. as a top operand with unmentioned skills. Lane is traveling with his wife and kids through Philadelphia just as a global outbreak strikes. Originally labeled as a type of rabies, the infected become undead zombies with ravenous hunger, and their bites spread the infection throughout the population. The U.N. wants to bring Lane to their secure outpost in order to utilize his skills in figuring out how to overcome the mysterious pandemic. But in order to help the U.N., Lane and his family must first get to a place where they can be transported to safety. This was a very suspenseful film. So much so that my wife was practically clawing my arm off at points. (Not that there's anything wrong with having a really attractive woman clinging to you.) By the end, I couldn't believe that two hours had flown past. The movie did a good job of covering the outbreak from a global perspective rather than staying focused around a single city or country. And I think it was a good change of pace that it wasn't full of gore, hence the PG-13 rating. This proves that you can still have zombies and the premise that goes with zombies (they eat people, can only be killed by destroying their brain, etc.) without having a blood-spangled guts-fest. I've been so used to "The Walking Dead" that I hadn't considered another way of conveying a zombie story through visual media. Another item that I both liked and disliked was how real it felt. Rather than a group of individuals trying to escape from zombies, a family is trying to escape. Not only that, but one of their kids has asthma. As parents of three children, two of whom have chronic health conditions, that really hit home for my wife and me. I watched the movie in 2D because I'm just not into 3D films (yes, I've tried recently with "The Hobbit", and it just didn't do anything for me). But I think regardless of the version you might choose, it will be entertaining and nerve-racking (in a good way). This past Saturday, my wife, father-in-law and I participated in Run For Your Lives! The touring 5K race features an obstacle course and zombies. What better way to race than that? The objective isn't to finish with a great time; in fact, I don't think there is an official time. Instead, you run with a group of racers that start every 15 or 30 minutes. You carry 3 flags that are attached to a belt with Velcro, similar (or perhaps identical) to flag football. If the zombies take all of your flags, you finish the race "infected" and receive a medal indicating that status. If you finish the race with at least one flag still attached, you are a survivor and receive a medal indicating that status. One of the people running the event said that before our shift, the survival rate was about 15%. 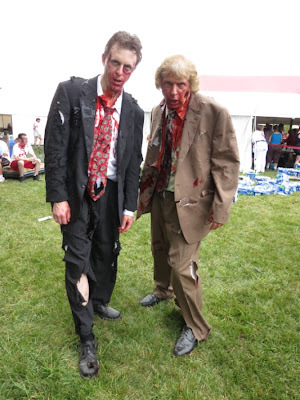 The event took place at Boondocks Farms in Knightstown, Indiana - not far from our home city of Indianapolis. It was an extremely well organized event - including everything from parking to registration to makeup, etc. They even made sure that zombies were kept well hydrated, and they also provided crackerjacks for us (which was good because we wanted a quick snack without eating a full meal). The three of us worked the third and final shift of the day as zombies. We thought it would be a cool theme if we dressed like business people - like we were in the office during an outbreak. 'Till Death Do Us Part... Or Beyond! One of my eight victims. We worked in the first zone, so runners encountered us soon after starting the race. It would be their first zombie encounter, and I don't think they had any idea what to expect. 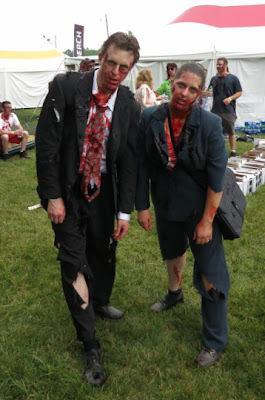 Some zombies are stumblers while others are chasers. We signed up as chasers, which meant we could run. 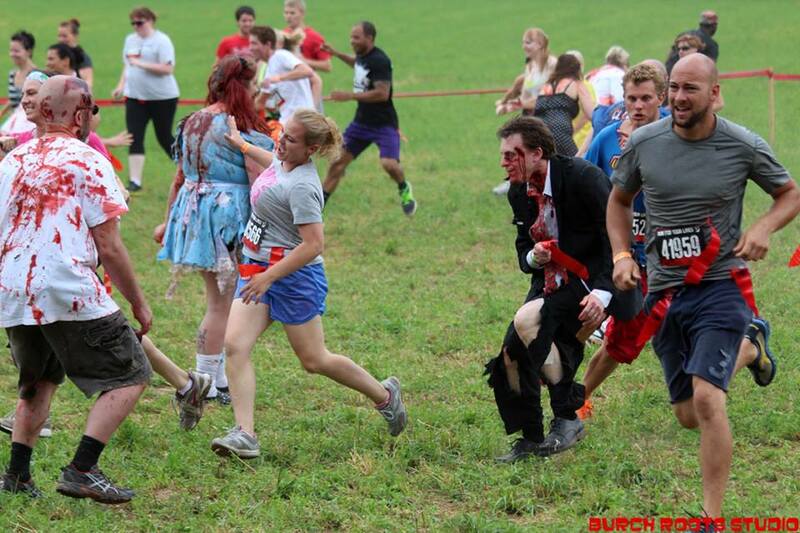 Even if the runners knew some zombies could run, they didn't know which of us could until we took off after them. A decent strategy was to act like a stumbler and then run. Since our zone was the first one, we would see a burst of runners followed by a long wait. 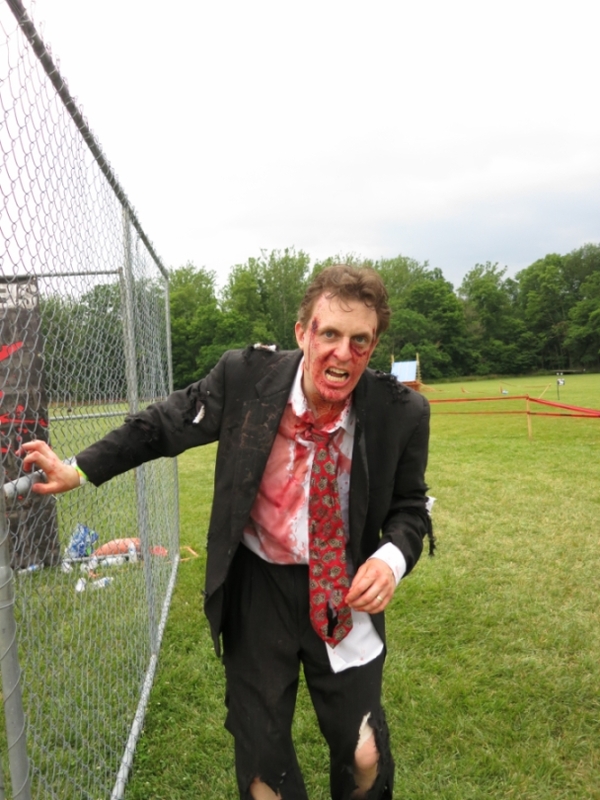 To pass the time, I would stay in character, stumbling around the field and posing for pictures. The surprising aspect to me was how many people wanted their pictures with my father-in-law and me. It could be that we would often walk around in character and groan at people. Then, once one person saw we would pose, more would approach us for photos. I love to do group shots and pose on demand; "Act like you're biting me," "Act like we're making a business deal," "Act like you're trying to take my beer." It was a lot of fun. Having just seen World War Z, I liked to chomp my teeth every so often. And rather than groaning, I would do a raspy yell, kind of a "mad dog" noise. I think it was somewhat intimidating; people tended to yell or scream in response. I'm not in very good shape, so I had concerns about trying to keep up the pace for a three-hour shift, but given the small bursts of action in our zone, that wasn't a concern. Other zombies in our zone were even sitting down at times while we waited for the next group. Other zones had more continuous action due to the fact that runners would inevitably spread out as the race went on, either due to different paces or the obstacles (some of which could only be done with a few people at a time). We weren't without casualties, even as undead as we were. My wife twisted her ankle on one of the last waves to come through. She's doing better today, but she sat for a while after our shift with ice wrapped around her ankle. Apparently, she was not the first to visit First Aid for such a condition. She runs regularly, but doing sudden sprints and changing directions on an uneven field can cause problems for anyone. I highly recommend this 5K race. To see this particular race from a runner's point of view, check out this video (this was not taken during our shift). Come as an observer, runner, zombie, or all of the above (there were people who ran it early in the day and then became zombies later in the day). I can't say enough good things about this event, so if there's one near you, check it out! A couple of weekends ago, my wife and I went to see the latest Star Trek movie, "Star Trek Into Darkness". Not to spoil anything, but if you're wondering what's in the darkness, it's action. Someone bombs a secret Federation installation in London, leading to a manhunt for a rogue Starfleet agent. The agent transports himself to an isolated region on the Klingon home world, likely to escape incarceration. Kirk and the crew of the Enterprise have orders to approach the Neutral Zone and fire photon torpedoes at the agent's location. Rather than complying, Kirk chooses to go directly to the Klingon world to apprehend the rogue agent. The agent reveals his motives, and the crew soon finds themselves in mortal danger. Throughout their plights, the crew faces one action sequence after another. There are countdowns to explosions, a chase through warp, and massive destruction. There are also a number of references to the Star Trek series/movies that fans would enjoy. I liked the movie, but it felt like there was too much action. I would rather have had more character development. I had some sense of who the characters were, but part of that is based on my familiarity with the Star Trek franchise. Spock probably had the most depth, seconded perhaps by Kirk, but there wasn't time to see too much beyond that. I was a bit confused by the references to the friendship between Kirk and Spock; I didn't really see much evidence of a friendship, other than their light banter. Seeing this action flick from the Star Trek universe makes me cringe a little because I'm concerned the next Star Wars trilogy may be similar. I don't want a hyped-up, hollowed-out version of Star Wars. Forget the prequels, I'm talking about the original trilogy; those had a great story, and though there was action, it wasn't all about making 3D viewers ooh and ah. Sure, a 3D light saber is probably going to be employed, but there has to be a good story as well, especially over the length of three movies. I hope Lucas can go back into his 1970's mindset and that J. J. Abrams can draw upon some of the magic from Lost. Combine that with modern technology, and it could be a really cool trilogy. Or it could be like Star Trek and just be some good action films. But even that would be better than the prequels, so maybe that's not so bad.